Minutes Spent Reading, and a Poll! I saw this article in the Chicago Tribune today, about high schools trying to balance teaching “classics” while still getting their students to read. It also talked about a trend toward more contemporary books, such as A Thousand Splendid Suns, The Things They Carried, and The Joy Luck Club, which may be easier for students to relate to. Along with the article was a chart showing the average minutes spent reading per day, by age group. I thought it was shocking! 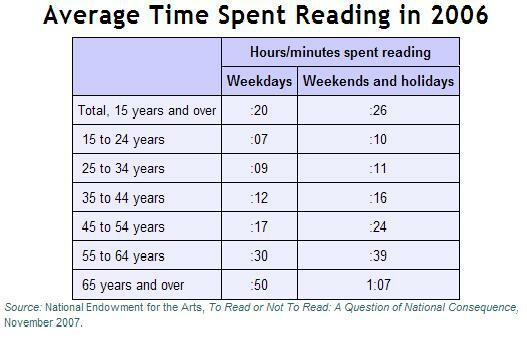 In my age group (15-24) the average time spent reading is 7 minutes per day! And only 11 on weekends. Now, I know being in graduate school means I am going to read WAY more than the average young adult, but it takes longer than 9 minutes to read the newspaper everyday! So I wanted to try the new PollDaddy feature of WordPress to see how much you all read! This entry was posted in Book News, Randomness and tagged Balancing Act with Books, Chicago Tribune, Minutes Spent Reading. Bookmark the permalink. 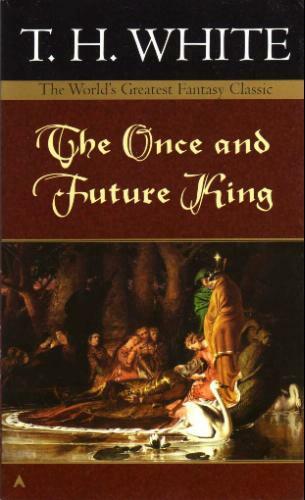 7 Responses to Minutes Spent Reading, and a Poll! Most days I’m about an hour to an hour and a half. Now, since I had to take so many research courses as an undergrad, you should know you’re poll will not be representative of the entire population…You hang out with many dorky kids who enjoy being nerdy and spend a Friday or Saturday night at home, instead of the bar. Now, since I had to take so many research courses as an undergrad, you should know your poll will not be representative of the entire population…You hang out with many dorky kids who enjoy being nerdy and spend a Friday or Saturday night at home, instead of the bar. I understand completely Lyndise. Plus, I think anyone reading a book blog may read more than the average person. OH, I have to return your Jodi Picoult book. Sorry it’s taken so long! I’m shocked by the number from the Chicago Tribune. Thanks for sharing. The days the kids have school, I read more. But, I always get at least 30-45 minutes in the evening. The day isn’t over until I read!